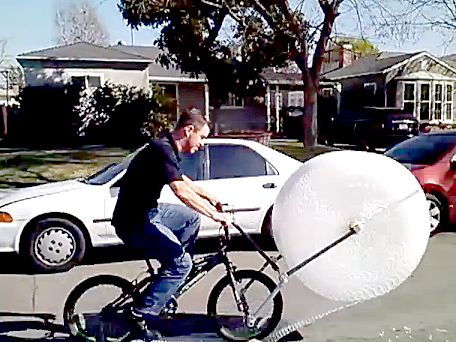 The crazy, bubble-wrap-popping bicycle demonstration comes courtesy of comedy magician Eric Buss, who simply calls it the "Bubble Wrap Bike." And in answer to his opening (probably rhetorical) question, I actually am a tad bit green with envy over this very odd contraption. While I don't see this product becoming a commercial hit anytime soon, it sure does look like fun to ride! And to check out more work by Eric Buss, be sure to visit his YouTube page by clicking here.